Last Tuesday I had the opportunity to participate in a two-part panel discussion on Healthcare and Social Technologies, sponsored by ASAE & the Center for Association Leadership. It was part of the organization’s first Healthcare Association Conference, bringing together leadership from many different medically oriented associations. Acronym, which is ASAE & the Center’s aptly-named blog, has posts recapping session one and session two. Ordinarily when I attend a conference I try to live-blog the sessions I attend, and for my presentation I create a post in advance to publish just before my session. But this was such a fast-moving discussion (even though the two sessions were 2.5 hours with an hour of that as Q&A, I think they could have gone much longer), that it wasn’t possible for me as a panelist to even surreptitiously tweet. So I’m writing what I think will be a few posts with observations and highlights of the sessions from my perspective, a few days after having arrived home from Baltimore, having digested both the discussion and Jeff Jarvis’ What Would Google Do? , which also has important related implications for associations and healthcare. Big Idea #1: As Frank Fortin, Communications Director for the Massachusetts Medical Society (which publishes the highly respected New England Journal of Medicine) said, “Associations need to figure out what business they’re in.” He has a blog post to that effect here. By confusing how they do their business with what it really is, businesses lose perspective of why they got customers in the first place. They build their businesses around the artifact of the transaction, rather than on the value they deliver. What is the business of the association? You might argue it’s publishing journals, holding conferences, or doing trade shows. But you would be wrong – very wrong. I’m sure no medical journal is more lucrative than the one Frank’s organization publishes. But as Jarvis says, “Beware the cash cow in the coal mine.” Often the existing business model hamstrings organizations, keeping them from exploring new services lest they “cannibalize” their current profitable operations. But again, as Jarvis points out, if you resist cannibalizing your own profitable products or services, that just means another organization will feast on yours. The example of Craigslist and newspaper classified ads is appropriate here, and it’s one I mentioned in the session. I recall paying north of $2,500 a few years ago for a job-recruitment ad in the Minneapolis Star Tribune. Then monster.com came in with price of a few hundred dollars, and its candidate pool wasn’t limited geographically as the newspaper’s was. And now Craigslist makes the ad free in most markets, or at most the charge is $25. Great for employers. Bad for newspapers. They (understandably) wanted to milk the cash cow as long as they could. But now the damage is irreversible in the loss of classified ads, because how could they possibly undercut the free service Craigslist provides? Last March, Baylor Health Care System, a large Dallas-based nonprofit, began purchasing keywords on Google, Yahoo and employment-related search engines SimplyHired.com and Indeed.com. The search-engine ads generated more applicants, at less cost, than the other recruiting methods, says Eileen Bouthillet, director of human resources communications. In the first six months of the program, Ms. Bouthillet says, the search-engine ads delivered 5,250 applicants, at an average cost of $4. By contrast, Baylor paid an average of $30 for each of the 3,125 applicants who came via job boards, and $750 each for the 215 applicants who replied to a newspaper or magazine ad. As a result, Ms. Bouthillet says Baylor has reduced spending on job boards and print ads. . . .
Was that last line really necessary? Application: As we discussed in our sessions, social networking tools have the capability of providing many of the benefits members have traditionally received from belonging to associations. If associations don’t provide for easy connection among their members, someone else will. So think about what business you’re in, and what unique value you can provide to your members. Take into account where they are on the spectrum of social media propensity, as outlined in Groundswell , so you don’t create platforms your members won’t use. You may want to use general purpose sites like Facebook or LinkedIn, or create-your-own social network sites like Ning, or even one of the many so-called “white label” alternatives that let you create a standalone network. Or maybe what you really need is a blog. But realize that in a world in which establishing and re-establishing connections is ridiculously easy (as the 29 members of my Austin High School Class of 1981 group in Facebook can attest), these tools are not just a threat to your current business model, but are great potential aids to help your organization (and its members) accomplish the goals you all share. 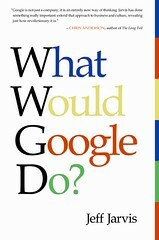 Book Review: What Would Google Do? I’m almost done listening to the Audible version of Jeff Jarvis’ new book, What Would Google Do? I’ve long been a reader of Jeff’s Buzzmachine blog, and so had eagerly anticipated his book. As a former media critic for People and the founding publisher of Entertainment Weekly, Jeff knows “old media” and has been thinking in public on his blog for several years about newspapers and other mainstream media can adapt to the realities of the Internet age. In WWGD?, he applies the new rules he’s observed to various other industries as well. I haven’t gotten to his recommendations for health care yet. That might deserve a separate post. Author Lee AasePosted on April 4, 2009 April 4, 2009 Categories Book ReviewsTags advertising, Boston Globe, Buzzmachine, Google, Jeff Jarvis, New York Times, What would Goggle Do, wwgd4 Comments on Book Review: What Would Google Do? Jeff Jarvis advises media companies wanting to survive to “focus on what you do best, and link to the rest,” which is why he thinks 15,000 journalists covering the major-party national conventions is a waste. I’m taking his advice in the SMUG curriculum, and taking advantage of some recent posts from Scott Meis, a SMUGgle from Chicago. Read these posts and you’ll have a solid introduction to Flickr. 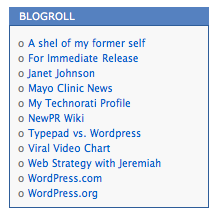 I also particularly liked a post by Beth Kanter in TechSoup, to which Scott linked in his Nonprofit Tips. Flickr is essentially YouTube for photos, although as Scott points out, you can upload video to Flickr if you have a Pro account. If you mainly want to share photos only with your friends, Facebook is your best choice. That’s why, according to comScore, it’s the #1 photo-sharing site on the Web. But if you want your photos to be available to anyone, Flickr is a great site for you. And as usual for these Core Courses in SMUG, Lee LeFever has a helpful introductory video, Online Photo Sharing in Plain English. Create a personal Flickr account. Paste the URL of your Flickr photostream in the comments below. (Scott’s photostream is at http://www.flickr.com/photos/bottspot/.